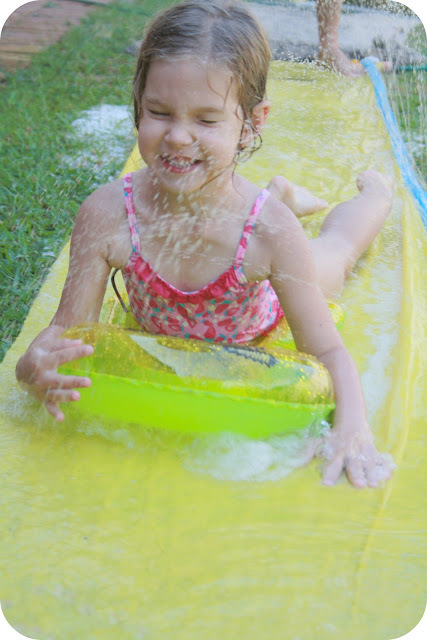 As a kid, I used to adore the summer slip & slide. Ours was just a sheet of black cladding plastic, cut lengthways and placed down a slope. Add the hose and some washing liquid and we loved it! My cousin and her husband bought this cool slip & slide for the kids when they visited recently. You just attach the hose, turn it on and it sprinkles you as you slide. It even fills up a little bouncy landing area, with more spurting water as you hit it. So much fun! I love that they will also keep the slip & slide as part of their summer memories. Did you have a slip & slide?